The EHA booth this year is next to Audi, who’s CEO two weeks ago announced the uptake of their FCEV. The EHA as a Eenrgy and Hydrogen Alliance is featuring its activities to accelerate Europe’s “Energy and Hydrogen transition”: from excess renewable electricity for wind and solar power to H2 storage in salt caverns and gas networks to local H2 networks powering transport, residential and industry applications. 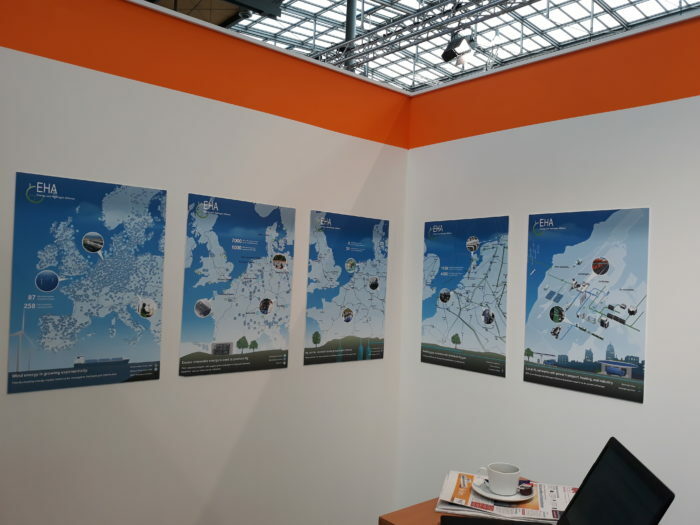 Sweden is the focus country of this year’s Hannover Messe and the EHA briefs this week will includeon updates of our Swedish member Hydrogen Sweden. The 22th Fuel Cell and Hydrogen Group Exhibit kicked off with a Hydrogen Valley presentation of the German government, the FCH JU and German Laender Hessen and NRW. The Chinese electrolyser and fuel cel ambitions werediscussed in relation to E4tech’s study of Chinese FCH developments. EHA spoke with representatives of a Dutch initiaitve on offroad vehicles that see big advantages of using hydrogen top ower their heavy construyction machinery: refuelling is a problem so new solutions need to be found to fuel these less mobile vehicles in a city centre. Toyota features its truck developments in their stand: their Long Beach port truck demonstrates the use of hydrogen in dedicatred truck movements around ports and toyota is interested to deply these trucks in otehr ports with similar truck movements as well.